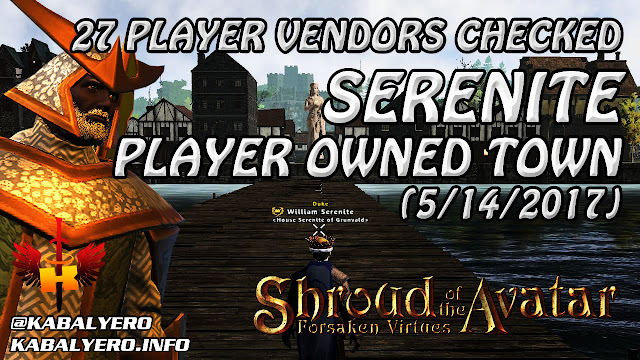 Serenite POT, 27 Player Vendors Checked (5/14/2017) 💰 Shroud Of The Avatar Market Watch - KABALYERO - PLAY, BLOG & EARN! It has been a while since I last checked the player vendors in the player owned town of Serenite and I did it after delivering 3000 Silver Ores to a fellow Avatar. All in all, I was able to check a total of 27 player vendors. Watch the video below to see what these player vendors are selling.